THE HERIZ RUG - Warm and finely gradated with elaborate motifs. Heriz is a quiet village on the slopes of snow-capped Mount Sabalan in northwestern Iran. The mountain--silent and monolithic--is in fact a dormant volcano, believed by some to be the place where Zoroaster meditated for years in quiet contemplation. According to nomadic belief, when its snow melts, the end of time will come. It is an historic and storied place, and for most of its quiet history, the small villages that dot its slopes had been known for traditional, simple, beautiful arts and crafts. 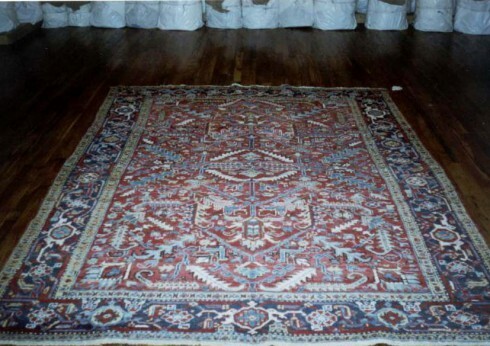 Heriz had been known in particular for making sturdy, rustic Persian rugs. The carpet-making tradition started simply. Among the nomadic tribes and sheep herders who called the region home, local weavers of Heriz produced their rugs for daily use: carpets for homes, and travel, and prayer. So it was something of a seismic shift when, in the 19th century, these local craftsmen started producing some of the finest, most sought-after rugs on the entire Persian market. In the early pangs of globalization, as European markets sought world art on an unprecedented scale, Heriz weavers responded by adapting their rugs for sale in Iran’s commercial centers. These are the rugs we know today as Heriz carpets, some of the most highly valued in the world. The history of the style can most likely be traced to the late 1800's, when rug merchants capitalizing on the growing market enlisted weavers of Iran's rural provinces to create room-sized, elegantly-patterned carpets they knew would fetch high prices in major cities. Traveling to Heriz, these merchants used templates, possibly even samples of the country's finest rugs, to introduce local weavers to the intricate motifs (and large sizes) then popular in their stores. Local weavers of Heriz, in turn, executed these elegant designs with a tough, traditional weave. Thus, what we know today as the Heriz rug is the result of an organic synthesis: local craftsman incorporating into their utilitarian work the elegant patterns of Persian royal textiles. This contrast at the heart of its creation is perhaps what makes the Heriz rug most easily identifiable. The tribal tradition of weaving is a coarser form compared with weaving seen in rugs coming out of Persian workshops of the 19th century. Designs are more angular, and traditional carpets are quite loosely knotted, not to the detriment of durability. 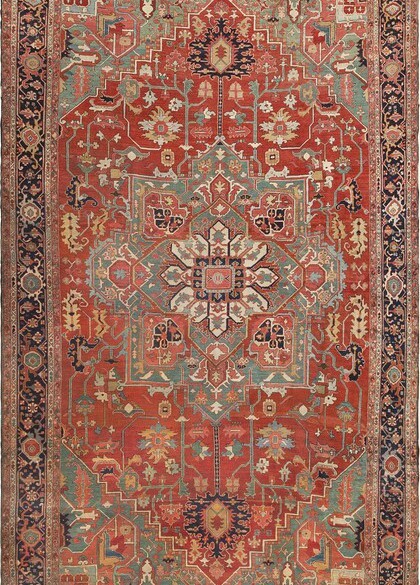 While there are comparatively fewer knots per square inch in the Heriz rug, construction is tough--the thick cotton warp and knots are tightly packed. The result is a work both rustic and elegant. Colors are warm and finely gradated; motifs are elaborate, while at the same time retaining a traditional, improvisational quality. The region of Heriz continues to make beautiful rugs today, not only in the town of Heriz itself, but in the surrounding 30 or so villages whose works, considered together, comprise the famous style. The contemporary rugs stay true to the form of the antiques, though there is a difference in the dyes. 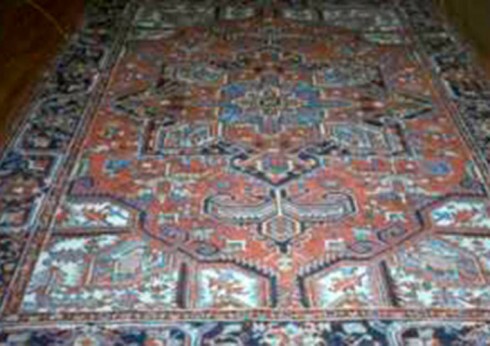 Older antique Heriz rugs were exclusively vegetable dyed, a craft at which the area’s weavers are old masters. By the 19th century, they had learned to employ abrash--the intentional gradation of color--to extraordinary effect. Colors of the antiques have continued to evolve with age, as dyes settle and develop an organic patina. By contrast, newer Heriz rugs (those made within the last fifty or sixty years) are usually dyed with a high quality combination of natural and synthetic dye, which have a stronger hold, and will retain a bolder color over time. 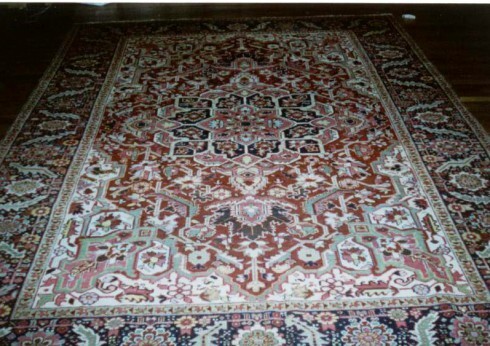 The preferred dye is largely a matter of style, and Heriz rugs—antique and contemporary—have become some of the most popular Persian village carpets on the market.